Bullying is of epidemic proportion these days by people of all ages. More than ever we encounter angry people, who have a chip on their shoulder and who’s aim is to start an argument or a fight with you. In addition there are so many emotional abusers whom we unfortunately encounter on a regular basis who’s aim is to criticize. put you down and control you. In Toxic People- Bullies, Critics, Control Freaks, and Fighters Dr. Glass shows you how to identify and deal with and heal from this group of Toxic People. It is read by world renowned human behavior and communication expert Dr. Lillian Glass, the original author of the best-selling book “Toxic People “since 1995. Through the popularity of this book she coined the phrase “toxic people” used in today’s vernacular.. In Toxic People ®: Bullying is of epidemic proportion these days by people of all ages. More than ever we encounter angry people, who have a chip on their shoulder and who’s aim is to start an argument or a fight with you. In addition there are so many emotional abusers whom we unfortunately encounter on a regular basis who’s aim is to criticize. put you down and control you. 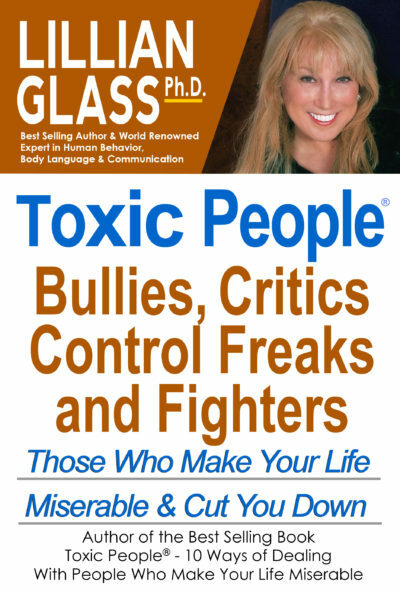 In Toxic People- Bullies, Critics, Control Freaks, and Fighters Dr. Glass shows you how to identify and deal with and heal from this group of Toxic People. It is read by world renowned human behavior and communication expert Dr. Lillian Glass, the original author of the best-selling book “Toxic People “since 1995. Through the popularity of this book she coined the phrase “toxic people” used in today’s vernacular. There are people who make your life miserable- a spouse, a parent, lover, friend. boss, or co-worker or even people with whom you do business. They can make you feel inadequate, worthless, causing emotional and physical distress. Not only does Dr. Glass help you identify this particular group of Toxic People in your life (Bullies, Critics, Control Freaks, and Back Stabbers), she also provides 10 proven techniques for successfully dealing with them including: Tension-Blowout, Unplugging, Direct Confrontation, Humor, Giving Them Love and Kindness, Mirroring and other techniques. This book provides answers to the age old problem of how to deal with and heal from anyone who has caused havoc in your life and made it miserable.